These capsules contain the whole dried plant material traditionally used in Africa to support healthy mood changes by helping to manage daily stress. * Kanna is one of our favorite herbs here, and several employees enjoy this throughout the day for an extra pleasant kick to their day. Relaxing but not sleepy, this is the perfect companion for anyone wishing to slow down and relax. These capsules contain the whole dried plant traditionally used in Africa to used to support healthy mood changes by helping to manage daily stress. * Kanna is one of our favorite herbs here, and several employees enjoy this throughout the day for an extra pleasant kick to their day. Relaxing but not sleepy, this is the perfect companion for anyone wishing to slow down and relax. 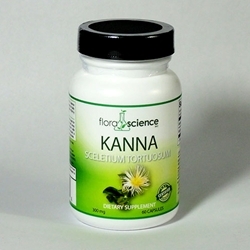 When we first discovered Kanna, we were blown away at the tangibly pleasant effects of this unique African plant. Speaking of, we get 100% of our Kanna and Kanna extracts from a small, sustainably-harvested farm in Africa for the past decade. We know the incredible quality of our Kanna because each batch is tested for alkaloid content at Wonderland Labs, our sister testing facility that has fingerprinted the entire ShamansGarden and IAmShaman product line, including this prized Kanna.